A bonus roommate edition for this rotten treat. Jon’s schedule wouldn’t allow it, so we changed it to Wednesdays and it’s been that way ever since. Bad Movie Wednesday has gifted us with some true classics, such as Dead Snow and Dead Snow: Red vs. Dead, and some films that required profuse apologizes from me to anyone who attended (In the Name of the King). Now the next couple sentences that came from this man’s mouth were so bizarre and so below literacy that I’ve decided to transcribe it for you: a zombie sheep bites people and they turn into zombie sheep. The man who wrote this script is named Jonathan King. He also was the director of this…thing. Mr. King is one of the stupidest human beings I have yet to encounter and at the same time, a marketing genius. Consider the concept of a zombie sheep. How does that even happen? Of all the animals you could choose to zombify, you chose a sheep? How about elephants? I think a zombie elephant would be horrifying. They’d stomp you until you were paralyzed, tear your ribcage apart with their tusks and then peel your intestines out with their trunks. It’s a win-win! What about zombie ostriches? Have you ever seen an ostrich? Ostriches are probably one of the funniest-looking creatures on this planet. Zombify them and you have comedy gold! Finally, and I know I’m stealing this idea from Monty Python and the Holy Grail, zombie bunnies. That scene in the movie with the rabid bunny is one of the more funny scenes I’ve had the pleasure of witnessing. I don’t know why someone hasn’t picked up on that idea yet. Like I would watch that! Wouldn’t you guys? Alas, we are stuck with sheep. Fat, wool-covered puff balls. Jonathan King is a marketing guru for the simple fact that he has discovered one of the secret truths of America: to attract the masses, think of something preposterously stupid and they’ll swarm to it like bees to honey. I am a guilty participant. We actually paid for this movie and when I say we, I mean Jon. Jon: Willingly and wanted to. Tim: We rented it on Google Play. Why? See above. And so, our adventure began. 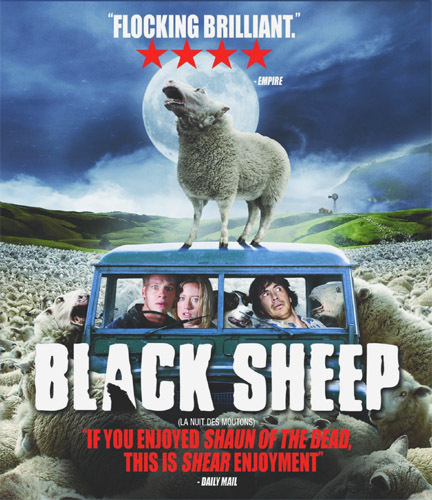 Black Sheep is a New Zealand film, the first I’ve seen. I’m proud to say my cinematic tastes are spreading. Dead Snow was Norwegian, now a New Zealander (Is that right?) one. The plot synopsis is basic. Genetic experiments turn docile sheep deadly and turn humans into giant sheep people. Jon: That’s not true. We really wanted that one guy to die. Tim:…and I don’t think anyone in the room cared about them. The story is truly irrelevant and what’s more is that King knew this. He wrote the story and he made it as bland and easily avoidable as possible in my opinion. It was so easy for me to detach myself from it. Characters that don’t matter, some plugs about how important the environment is. Without the comedy, this film is pretty boring. I wouldn’t say bad because the acting isn’t intrusive and the scripting is applicable to the characters. At least it sounds believable, to an extent. Some of the plot turns are way off track but despite the film being at a mediocre level, a few things rise it out of the sheep intestines. The cinematography and visuals, overall, I was pleased with. They weren’t amazing, but considering the film’s budget and what they had to work with, I’ll give them a thumbs-up. The costumes were silly at the beginning but as the film progressed the quality improved. Jon: If there is a sheep in a hallway staring at me after I just found blood, I’m probably going to walk away. Shoots zombie sheep in the face and it comes back. P.S. Don’t have sexual relations with sheep. My score for Black Sheep: 66. This movie was awful but also great. Really don’t have much to say aside from that. It’s been two weeks since I’ve seen this which is why this review is so crappy. Sorry. Ladies and gentleman, let me introduce you to Taken 4. I’m as surprised as you. I didn’t expect another sequel so soon after they just made Taken 3 in January but I guess we underestimated the work ethic of Hollywood, huh? This isn’t even a joke, guys. I’m serious. Run All Night is a garbage title anyway. If Taken 4 Run All Night printed their DVD covers and put a duct tape graphic over Run All Night and wrote in red or black sharpie on top of that “Taken 4“, I would buy this movie just for the simple but yet evidently difficult admission that they didn’t try to make an original film. If you see Taken 4 Run All Night, Neeson’s opening monologue contains that phrase almost verbatim. I chuckled to myself and looked over to my mom and she was already angry with me, claiming I wasn’t giving the film a chance. Liam Neeson is her favorite actor, which is why I was in the theater watching this. I love Liam Neeson. He is one of my favorites as well, but how do I watch an actor deliver a monologue not just from the same cloth or the same script, but the exact line from another film and keep a straight face? Tell me in the comments if I’m being unreasonable. So, I’ll admit it. It was really hard for me to try to engage myself in director Jaume Collet Serra’s third Neeson experiment. He directed Unknown, which was a miss for Neeson but got back on track with last year’s Non-Stop. Non-Stop wasn’t great and I’ll admit I scored it higher than I should have, but the film had some originality to it and held suspense over me despite the fact that all of the happenings took place on an airplane. And despite Non-Stop being a decent action flick, I wasn’t all that impressed with Neeson’s part. The character writing was far too rigid to make much of anything out of it, but Neeson tried and I’d probably give him a win for that. Also, if you don’t know what I’m talking about, after this post, I’m going to start my new series called Winners and Losers. There will be an explanation of the series and what to expect from it so you’ll know what I’m talking about then. Until then, I’m leaving you in the dark, which is ironic because that’s what I felt Run All Night did and not because it was shot in the dark, you smarty pants. I don’t mean left in the dark in the sense that we didn’t know what was going on. Trust me when I say that you will know EVERYTHING that is going on, has happened and will happen later. A map wouldn’t have made this film any easier to navigate through. We already found one in Neeson’s introduction. What I mean by left in the dark is that the performers, story and production as a whole never grabs us by the shirt collar and tries to bring us into the experience. The light is in the middle of the stage and I’m standing behind the curtain reluctant to go out. This film, if it were a person, gave me a light tug that even a toddler could have held back from and then gave up. I can not recall a film that gave such a fetal effort to involve me in its story. It was truly pitiful. What made it worse is that Run All Night didn’t just copy off of Taken. It stole the script from Road to Perdition, which I wrote a review on. The story of Road to Perdition, if you find yourself a little too lazy to read the review, is the original Run All Night. Michael Sullivan (Tom Hanks) is a gangster hitman but his sons don’t know that. Stuff happens, Sullivan’s wife and youngest son are killed by the mob boss he works for after his eldest son, Michael Jr. witnesses a mafia murder. Sullivan and his son rob the banks that have the mob money and Sullivan kills a bunch of people, but he won’t let his son do any of the killing because he wants his son to live a good, clean life. Sullivan is convinced he’s going to hell, but he believes that there’s hope for Michael and that belief is what drives Sullivan the entire movie. Run All Night is almost the same thing aside from a few minor stipends. Jimmy Conlon (Liam Neeson) is a hitman whose life is pretty much over. He’s still a part of the gang but he’s getting old, his wife’s dead and his only son, Michael (Joel Kinnaman) won’t talk to him because of the things he knows his father did. Conlon’s best friend and boss, Shawn Maguire (Ed Harris), are the best of buds and served in the military together. When Maguire’s son, Danny (Boyd Holbrook) goes off the deep end and murders two heroin dealers, Michael, a limousine driver, witnesses them and runs back home, so now Danny feels he has to kill Michael. Conlon saves the day but takes the life of Maguire’s son and even though Maguire admits his son “went wrong”, still feels the need to claim revenge and kill Michael himself. The rest of the film is pretty predictable and I’m not going to go any farther with it. Just know that if you’ve seen Road to Perdition, you’ve seen this movie. The fact that the son’s name is Michael in both movies only enraged me further. Come on, guys. Really? Whereas Road to Perdition is more of a drama, which you should expect when you see the name Tom Hanks, Run All Night is more of an action flick, which you should expect when you see the name Liam Neeson. Collet-Serra’s attempt at action doesn’t interest me though. There were a few segments where I got a little excited but I’d like to emphasize the word “little”. They weren’t overly original including yet another action scene in a bathroom. I don’t even want to go over the scene where Conlon strangles a guy with a paper towel roll and yes, that actually happened. Paper towels are meant to separate when pulled. How hard do you have to pull the paper towels in this world to separate them?! Do you expect me to take this seriously? A plot synopsis like this only made me that much more thankful to have Liam Neeson in my life because he was the only thing keeping this thing afloat. Neeson has developed a certain talent for livening things up. Similar to Statham sometimes in the roles he chooses, Neeson has the bravado required to shoulder a shoddy film and provide some sort of enjoyment for a disgusted audience. I wish he was more selective with his roles, but Neeson is still one of today’s biggest action stars. Taken, the cult classic that it is, brought a new weapon to Neeson’s repertoire. Neeson’s acting career was on the downturn but after the success Taken had, Neeson suddenly had another coal in the oven to burn before his eventual retirement. Joel Kinnaman started his career with no coals in his “acting oven” and doesn’t look to be adding any anytime soon. No true connection was to be found in this father-son relationship. Ed Harris was left lifeless with his poor character arc and dialogue. My score for Run All Night: 53. Taken 4 meets Road to Perdition in an action flick that I’ll applaud for its scene transitions but little else. Aside from yet another Liam Neeson appearance, it’s a film worth skipping on. Run All Night is one to run away from. If you haven’t read my The Art of the Trailer post, read it! I worked hard on that! If you still haven’t read my post, you know that missing out on Interstellar was one of my biggest regrets of 2014. Christopher Nolan is one of the best in the business. His visionary ability for story-telling, visuals and impactful dialogue are second to none. He’s already made a legacy and it’s only been 17 years since his first film (Following, 1998). He’s 44 years old and I’m confident he still has a lot of gas left in the tank. The fact that Christopher Nolan hasn’t won an Academy Award yet is flat-out disturbing. His 2001 film, Memento, was nominated for Best Original Screenplay but lost to Gosford Park, whatever that is. Haven’t seen Memento yet, but it’s Christopher Nolan. Seems safe to assume it was great. His other two nominations came in 2010 for Best Original Screenplay and Best Picture for Inception. The King’s Speech won both of those. Nolan did not receive any nominations for the Batman trilogy or for this space epic. Wally Pfister was nominated for Best Cinematography for Batman Begins, the film’s only nomination. The Dark Knight received eight nominations, the most nominations for a film based on a comic book, comic strip or graphic novel ever. Heath Ledger snagged the Oscar for Best Supporting Actor and the film was acknowledged with the Oscar for Best Sound Editing. Interstellar was nominated for five awards and its lone winner was for Best Visual Effects and deservedly so, although the argument could be made for Dawn of the Planet of the Apes. With the sidebar finished, that brings me to my next point: How has Hollywood not acknowledged the greatness of Christopher Nolan yet? If you were to ask any major film critic to name some of the best directors of the 21st century, I have to believe Nolan’s name would come up. Yet Nolan’s Academy case remains empty, which is really sad when you consider Danny Boyle won Best Director for Slumdog Millionaire. Has anyone seen Slumdog Millionaire, a film that won not one or two, but eight Academy Awards in 2008? That film was absolute garbage. If you can win an Oscar for Best Director for a turdblossom like that, how has Nolan not won one yet? I wasn’t wild about Inception, but it was impossible to ignore the out-of-this-world cinematography and visual effects, as well as the one-of-a-kind story that is sure to throw you for a loop on various occasions. I read some reviews from my blogging compatriots that said Interstellar did not have the same tonic as his previous films. After witnessing Interstellar, I question what they were talking about. This film was every bit as good as I expected it to be. If there was anything wrong with Interstellar, it would be the turtle pace the film upholds for every second of its 169 minute running time. For nearly three hours, you will see a story that graciously skips some details that are completely irrelevant but then decides to ponder on others for reasons unknown. People less patient than I will become exceedingly frustrated by this to the point of leaving the experience. Only a master storyteller can imagine a world that blows our minds and can search through the boring everyday film material and derive not just a few cents worth of original dialogue, but dollars of it. I just watched the last scene of The Dark Knight on TNT and that scene alone demonstrates the mastery of Nolan’s pen. He’s done it again and again, with Inception, the Batman trilogy and now this space odyssey if there ever was one, for the gallery of visual shots that is paraded by the eyes of its viewers is splendor, pure and unbridled. Dwelling in space never felt so lifelike for me. Yet the story that Nolan draws up and the pawns that push it forward may be the film’s greatest accomplishment. In my opinion, the film’s visuals were predetermined. Space is an unknown dimension for most people and filmmakers have the luxury to create it in their own eyes for that very reason. Not all directors are so gifted at doing so, but we’re talking about one of the finest of the 21st century. Nolan is no novice. A great artist behind the camera can illustrate things to amazing dynamics. A great writer is limitless. A limitless writer is a rare find in every pursuit of life but especially in film. With the disease of sequels infecting the minds of Hollywood more and more each year, original ideas become less and less, swallowed up by the greed of industry. Up to this point in his career, Nolan has been unswayed by such motivations and has been rewarded with cinematic gold as well as two of the 19 films to cross the billion dollar threshold (The Dark Knight, The Dark Knight Rises). For that, I am forever thankful. My score for Interstellar: 90. Awe-filled and the definition of grandeur, Interstellar’s got some phenomenal acting, great scripting and award-worthy special effects, yet I still can’t recommend this to everyone because I know some people won’t like it. Neill Blomkamp is becoming one of my favorite directors. The apparent sci-fi god of South Africa, Blomkamp came onto the scene in 2009 with the box-office hit District 9, a film that garnered him an Academy Award nomination for best adapted screenplay. If you’ve seen District 9, you know that Blomkamp is his own man and like no other in film right now. His camera work has a documentary taste to it, giving his shots a story-like feel. When I first watched District 9, I started it over after five minutes because I thought I had accidentally chosen the behind-the-scenes section. If you don’t know, District 9 starts with interviewing a bunch of characters. That’s something you don’t see in movies: something that throws you for a loop straight out of the gate. I’m not saying I haven’t been blown away by some opening scenes. That happens on occasion, but to be thrown for a loop and see something you’ve never seen before? That’s a rarity. Which is why, when I saw the phrase “the director of District 9” come across the screen for the Chappie trailer, I knew I had to see it. And Neill Blomkamp’s record with me is solid. District 9 is one of my favorite sci-fi films and while last year’s Elysium couldn’t compare with District 9, it was a box office success. It was slow-moving but the final third, as well as the driving force duo of Matt Damon and Sharlto Copley, made this film one I need to get out, buy and relive. What made me want to see this film so much and why Chappie ended up being such a success with me was because of the themes and ideas it conceptualizes in its story. That’s one of the things that I love about Blomkamp: his ability to weave ulterior motives into his framework. A robot police force has reduced crime in Johannesburg, but the creator of these robots, Deon Wilson (Dev Patel), believes in something more, an artificial intelligence that can replicate the human mind. With so many dystopian films highlighting our bookshelves and theater platforms, technology is an easy target. In a world overrun by it, surely this is where our future could go wrong. It’s something many people can get behind. Yet, it’s important to remember that there are two sides to every coin. Think of the potential that technology holds for good. Chappie is that untapped potential unveiled and paraded for us. A police bot reprogrammed, Chappie is brought into the world like a child. Growing and learning words and behaviors at an accelerated pace, Chappie‘s two-hour run time gifts us with the whole life of a person made of metal. Frightened and unsure of his surroundings, Chappie is subjected to the beauties of life, as well as its harsh realities and must discover on his own how he feels about this world he’s come into as well as the people in it. It’s a journey I think we all want to embark on. How do we feel about the world at the end of the day? Each night before our head hits the pillow, do we smile or do we sigh in disgust? What from our time here have we learned about the world? Are we a black sheep like Chappie, different from the rest? Are we the only one who can truly understand us? Are we black sheep? Blomkamp presents a lot of questions, both personal and societal here. He never fails to keep me thinking. While Chappie’s narrative has been bashed by critics, I felt the narrative worked, for if it wasn’t presented the way it was, the themes, which are and always have been Blomkamp’s bread and butter, wouldn’t have transfused as precisely as they did from maker to machine. Are the characters rather generic? Yes but they symbolize the world around us nonetheless. Chappie and Deon are the standouts here. All the other players, including Hugh Jackman, are there to further Blomkamp’s agenda. Is that a disservice to the characters and actors/actresses? Perhaps, but it was done for the greater good and so I can’t fault Blomkamp for going about it the way he did. Did it hamper the acting? Yeah, a little bit. Hugh Jackman doesn’t get to stretch out his jaws for this role but got me fired up all the same. If an actor can siphon my emotions despite playing an unoriginal character, then they did a good job. I hated Hugh Jackman’s character by the end. The robot design was unique and the body movements and facial expressions added a lot to the character. The sets only furthered my intrigue. My score for Chappie: 92. Blomkamp delivers yet another sci-fi hit and Sharlto Copley finally gets back on track with his acting career after last year’s cell-destroying performances from Open Grave and Maleficent. Already looking to be one of my favorite films of the year. It’ll be hard to beat. Hey guys, it’s been forever. It’s spring break so I’m getting caught up on all my writing, reading and TV shows. I’m going to get some movies in this week, I’m starting up a new series and I’ve got this long feature for you. Enjoy! Trailers are one of the most important jobs in Hollywood because even if your movie is garbage, if you make a good trailer, people will flock to it like geese to bread. It’ll make tons of money. People will hate you once they get out of the theater if your movie was in fact garbage, but you made your payday. Good for you. I say that because rarely do I fall for the Hollywood trailer gimmick, as I like to call it. I can usually tell by a trailer if a film is going to be any good or not. I’m not saying I haven’t seen bad movies at the theater. I have but that’s usually because I knew it was going to be bad or didn’t have high expectations for it in the first place. Rarely do films surprise me with their stupidity is what I’m trying to say. So today, I’m talking about the art of the trailer, why trailers are so important, etc, etc. Five great ones. Better they are, bigger the pictures. Godzilla wasn’t liked by some but I personally loved it. I thought it was the film that Godzilla fans like myself had been waiting for. Yes, Godzilla didn’t have a lot of screen time but it was still a blast. The suspense was great and it worked well with the final product which can be seen with this trailer. Bryan Cranston’s narration at the beginning of this teaser was a huge plus. To follow up his phenomenal TV drama, Breaking Bad, which I hope to start this week, he delivered an exuberant performance to start off this blockbuster. This film was all about the anticipation and suspense of seeing the giant lizard behemoth and that was both this trailer and this film’s greatest success. A simple score, coupled with some narration from Cranston and from Ken Watanabe, aligned with some visuals that foreshadowed some of the plot as well as the visual effects we were to witness with this summer blockbuster. That Godzilla roar at the end to top it all off was a great bravo. One of my greatest regrets of 2014 was not seeing Christopher Nolan’s Interstellar. Some reviews I read weren’t flattered by the material but regardless of whether it’s a monumental discovery in film-making or a treasureless venture, I know I have to see this film because this trailer was pretty great. Something that can really boost a trailer is a fantastic score and Hans Zimmer never fails to impress me with his compositions. Music is capable of things that no other form of art can describe. You can only visualize so much through your eyes but with your mind, you can imagine everything. If you know anything about the art of trailer-making, you’ve got to know that. The guys who worked on this beauty certainly did. Second, we need to know what your film is about, at least a little bit. A general plot synopsis in under three minutes. For action films, that should be pretty simple: gunshots, rockets, grenades, explosions, insert catch phrase here, coming November 2015. Done. For dramas like this, we need more than that. We need something to instill belief in us, make our spine tingle. Give us some dialogue that alludes to the plot, what we’re investing in. Third, narration, narration, narration. The tool of narration is easily the most important tool in trailer-making. The voice of an actor reading thought-provoking lines will almost always hook an audience but the voice you choose is equally important. I intend to be offensive here because I hate the guy, but if I ever had to listen to Vince Vaughn deliver an opening monologue to a trailer, I think I would vomit all over myself and have to leave the theater. Three big names come to mind: Morgan Freeman, Russell Crowe and James Earl Jones. These guys have voices that paralyze you and no matter what comes out, you can’t stop listening. They have commanding voices that demand attention and that’s what your trailer should be reaching for: attention. Matthew McConaughey has that type of voice, as does Michael Caine and they use it to incredible effect here. What they’re saying is just as memorable and instilling to your emotions. Overall, the plot synopsis was a little weak, because aside from space exploration I didn’t get much from this, but the monologues and dialogue is fantastic and still has me hooked. Next up on this list is a film that just opened up this weekend and was one of my most anticipated films of the year: Chappie. As soon as the screen read “The Director of District 9“, I knew I was going to see this, but this trailer does so much more than put a director’s name on the screen. Again, Hans Zimmer on the score. He makes it seem so easy, the way he inspires. Again and again, this guy’s name comes up and again and again, I leave amazed with the product he delivers. Seriously, that guy needs a raise. Something this film utilizes is a black screen with words on it. If you’re going to make a trailer, do this sparingly because no one wants to read a trailer. They want to see it, hear it, visualize it, imagine the future product they might be investing themselves in. You want to get people excited. This trailer does all of that, but unlike Interstellar, chose to put words on the screen. Every word you put on the screen’s got to mean something. It needs to have a purpose and a drive to it. Chappie’s trailer does that. It’s always nice if you can showcase who’s in your movie without me having to look at a cast list. Hugh Jackman gets some screen time with this as does Dev Patel, but it’s Chappie that gets the attention and deservedly so. If you can present themes in your trailer, you’re really reaching for the stars and Chappie does that. There’s a line in the trailer: “People are always fearful of something they don’t understand.” We’ve all heard this statement before but this is one of the numerous themes in this sci-fi epic that hits home with its viewers. I applaud the makers of this for getting themes into the trailer because if you’ve had the chance to see Chappie yet, you know it’s all about the themes and the character that Chappie emboldens, someone who starts out innocent and quickly realizes what a mess the world is. Unbroken, Angelina Jolie’s directorial debut, had the best trailer of 2014 in my opinion. It’s plot synopsis was on point. Unbroken, based off this trailer, is clearly a film about identity, about finding yourself and about believing in yourself to an extent that doesn’t seem possible at first glance. It’s about having an unbreakable resolve. Once again, some great dialogue from our actors along with a score from 2014 Academy Award winner Alexander Desplat to bolster the heart this trailer offers. That’s something I have yet to talk about when it comes to trailers: heart. We want to know the plot, we want to get pumped for this feature, but we also want some heart. You don’t have to pull heart-strings but we should care about our protagonist’s plight. We should be able to put ourselves in his shoes. Some characters aren’t very relatable, but for the sake of the trailer, it’s your job to present him as such. What can we gather from his tale? What application does the story have to our lives? These are not all musts, but if you’re able to answer a question like this or similar to this in your trailer, it’s a big plus. This story and really this whole film is about heart and being resilient to the torment you face, no matter what that torment is. Something I think I’ve mentioned with all these trailers is their ability to pull out the gold nuggets of dialogue their film contains. Unbroken‘s trailer was no different. True, this film didn’t come close to reaching the excellence that the trailer did, but it had its moments. Man of Steel. This trailer breathes awesome and eats Wheaties for breakfast. Man of Steel is one of my favorite movies of the past five years, hands down. It’s not one of the best of the last five years, I only gave it an 87, but I love it all the same. Prior to this film, I hated Superman. The whole concept of Superman is just stupid. He’s invincible, with no weakness except for a green rock from his planet, which was blown up and therefore should not exist but by some completely unexpected and not at all being sarcastic here coincidence, manages to find its way into Lex Luthor’s hands time and time again. But this trailer and this movie made me believe in the man of steel again. I’ve never seen a Superman movie so well done and after years of garbage that cinema fans had to trudge through, Zack Snyder gave us this beauty, but not before releasing this premium trailer that takes people to school. Again, music is a huge thing and again Hans Zimmer cracks one outta the park. Hans Zimmer and John Williams are the best composers in theatrical music right now, with Howard Shore coming up behind and if you get them to work on your splendors, you won’t regret it. This trailer features the theme of Man of Steel, which won my Best Score award for 2013. Man of Steel parades its cast list around and they’re all memorable clips that hit you where it counts. Russell Crowe’s voice was meant for narration. Kevin Costner’s fatherly image, Michael Shannon’s now infamous, “I WILL FIND HIM!” Henry Cavill’s soft-spoken voice fitting perfectly with the character, the list goes on and on. The slow fades went well with the anticipation that Zimmer’s score is unleashing on the stereo and when the music reaches the climax, so does the action sequences and visual effects, which in my opinion, were the best of 2013. I have this trailer favorited on my Youtube channel if you can believe that. What are your favorite trailers? Let me know in the description.